It’s Tuesday, so it’s game day once more here at spalanz.com! Today I’m going for something a little different, as I throw the spotlight of awesome onto a game many of you may well be familiar with, but it’s something that has only recently come under my radar. Recently, as in last week. 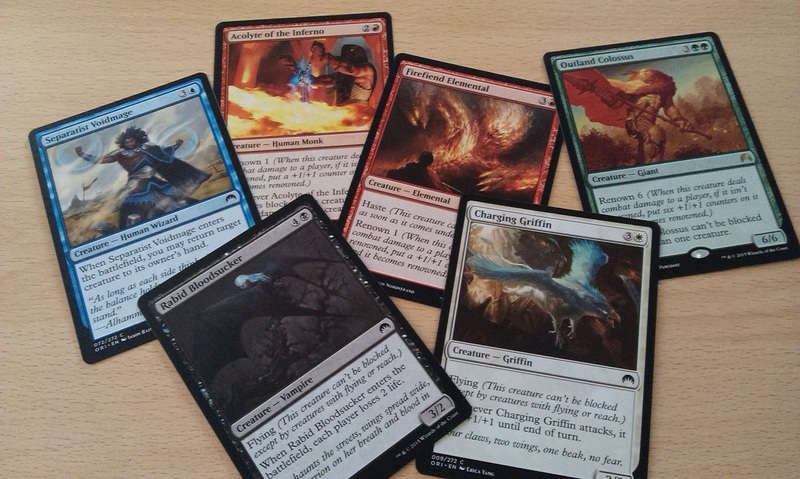 It’s time for Magic: the Gathering to arrive! 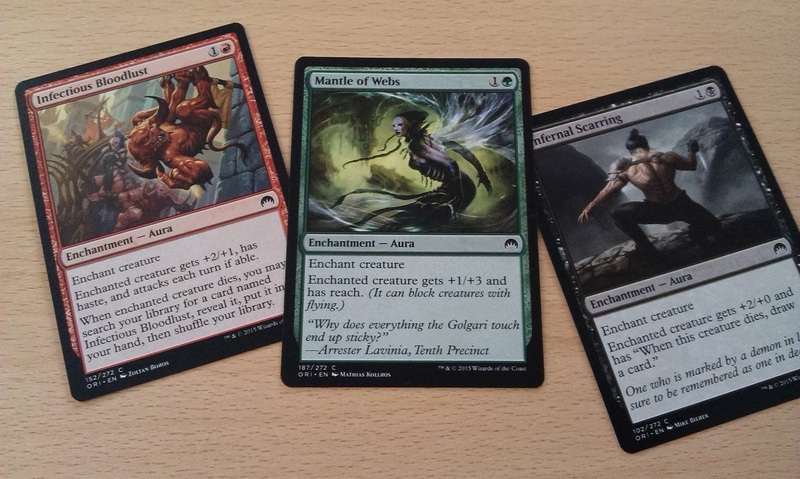 Enchantments function like Attachments, which buff your creatures in some way or affect your opponent’s guys. 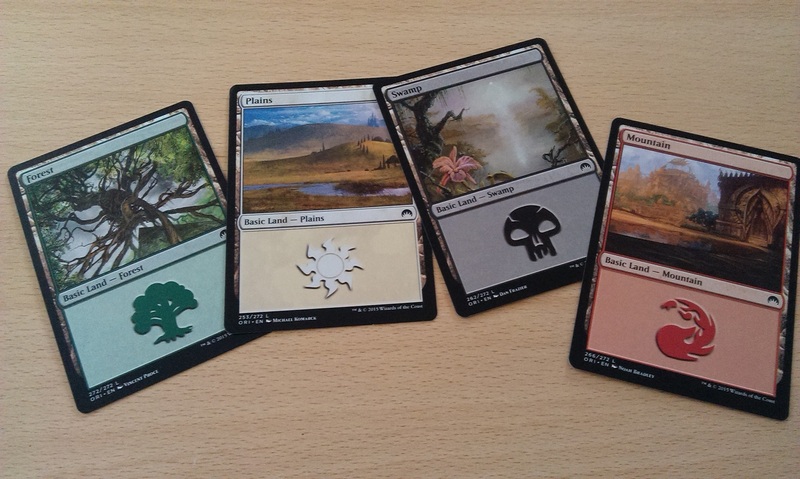 All of these cards have a coloured border, which denote one of the five colours you can play. 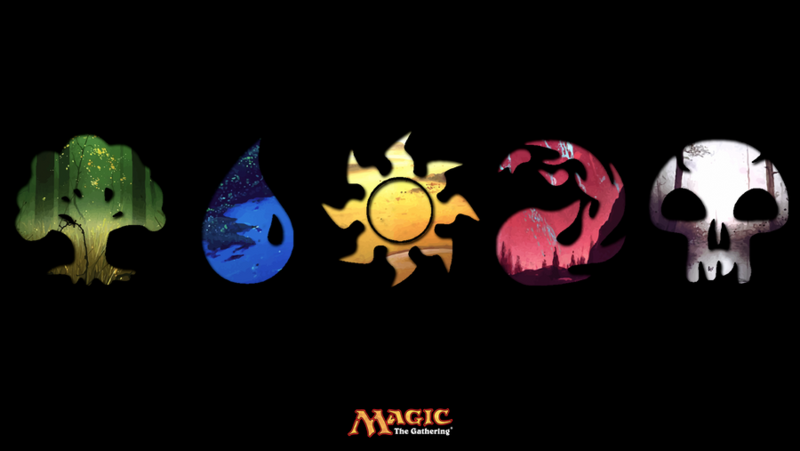 Kind of like factions, these colours each have a specific play style, and the mana cost to cast them will normally require at least one mana from the matching colour. You also have some more odd sorts of cards, such as colourless (neutral) and multi-coloured stuff. These cards have their mana cost printed in the top-right corner, which shows the mana cost made out of either the coloured symbols, or a number within a grey circle that represents “generic” mana that can be made up out of any colour. 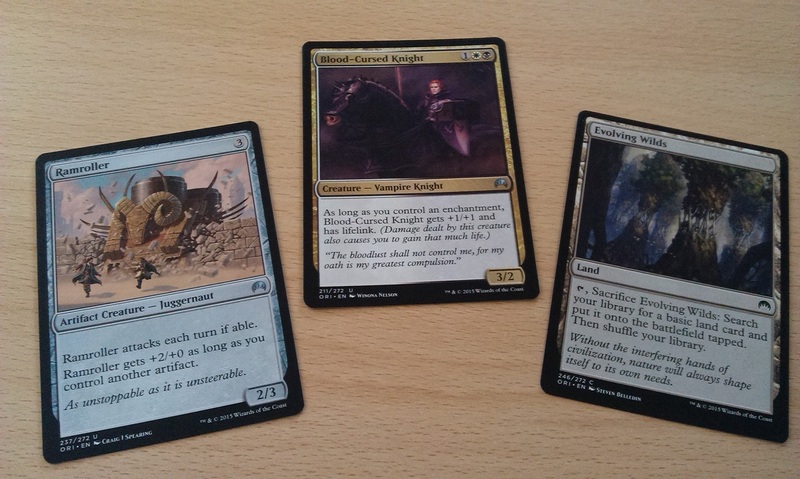 So in the picture above, Ramroller requires three mana from any colour, while Blood-Cursed Knight requires three, one of which must be white, and one must be black. In the bottom-right corner is the attack/defense value, so the Ramroller deals 2 damage, and has a health value of 3. During the turn, you have two main phases either side of a combat phase, along with a beginning and an end phase, for five phases in total. When you play a creature card, it normally enters play “sick” and cannot be used that turn, though there are some with creatures with the Haste keyword that allow them to be used when they’re cast (see, I’ve learnt stuff already!) To play a card, you need to pay the mana cost as described, where the mana cards are “tapped” – that is, turning them on their side. You don’t get to “untap” until your next beginning phase unless you have cards that allow you to untap early. Also, when you use a creature to attack, it is also tapped, so you always have the decision of whether to attack or keep your guys back to block in your opponent’s turn, as blocking does not cause a creature to tap. When you block, all damage dealt from the attack is absorbed by the defender, even if it is more than enough to kill it. This is something that I couldn’t quite get my head around first, as I’m used to stuff like Lord of the Rings LCG, where excess damage goes somewhere else. However, creatures with Trample do deal their excess damage to you directly. When your life is reduced from 20 to 0, you’re dead. Apparently, a deck consists of 60 cards, with roughly 40% of that being land. From what I’ve seen so far, the dual-colour deck seems to be the most common thing – indeed, Magic Origins has just been released (as of this writing), and is sold (among other ways) in Intro Packs that feature one deck and two booster packs, said deck being a dual-colour thing. I picked up one such pack at the weekend when I bought the new Age of Sigmar box, as there was some sort of event going on at my local store and I kinda got caught up in it all. So yeah. I told myself I’d never get into another CCG after the Star Wars card games of my youth, but then I discovered the show Spellslingers on Geek & Sundry last week and it looked really fun. In a lot of ways, it looks like the sort of card game I’ve wanted to play for a while, as it looks very straightforward. I mean, there’s a lot of stuff you can do, but when compared with some of the LCGs I play, where you have a lot of specific things going on, just throwing cards against your opponent for a game looks like it’s actually a really decent battle game. So here’s the thing. I haven’t actually played a game with it yet – well, I only bought a deck on Saturday – but I have been playing quite a bit with the app that’s available. It’s a pretty good app, I must admit, with a lot of great effects to enhance the experience (particularly when dealing damage – nice!) 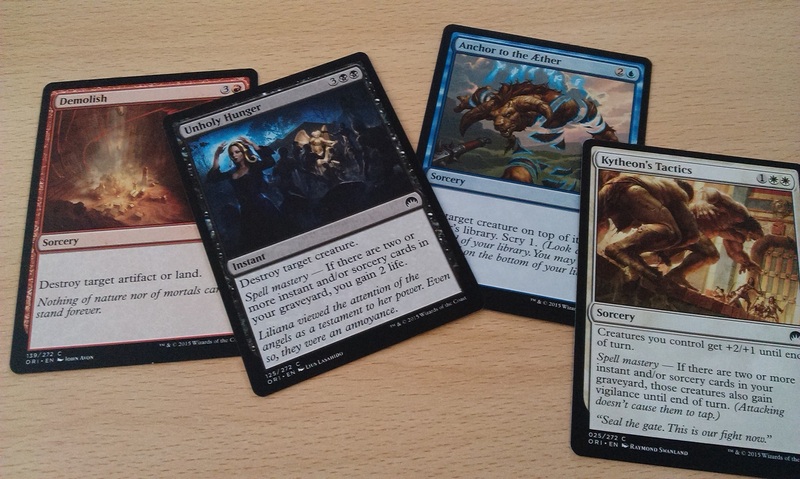 However, nothing can really substitute having actual, physical cards in your hand. I find Magic to be one of these truly legendary games, much like D&D, that people have likely heard of even if they aren’t into this whole thing. It looks exciting, anyway, and I’m looking forward to a real-life game – hopefully soon! Pingback: Returning to Middle Earth! Previous Previous post: Sigmar Saturday!